You can now choose to notify any user when a new contract is added to a folder. This can be super helpful if one person is responsible for an area (e.g. HR) and needs to know about new files that are added to their folders. Here's how to do it. This feature will let the right people know no matter how the contracts come in -- via email, through DocuSign or SalesForce integration, from a scanner, or just a plain old upload! 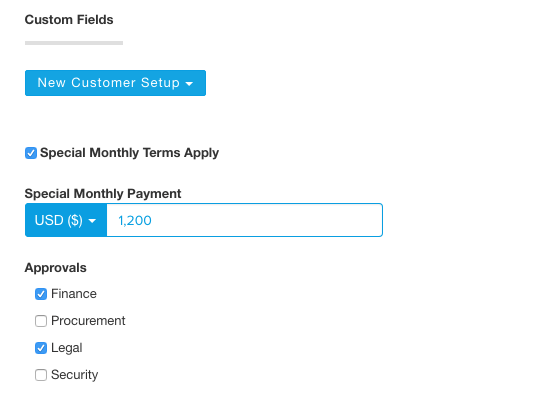 Now ContractSafe customers can create multiple choice fields in Custom Fields. Track approvals in a single field (Finance, Legal, Security). Show the branches a contract applies to (East, West, North, South). You're no longer limited to only one selection. The possibilities are endless! Even better...you can then display all this information in the Contracts List. Both of these features should help save you time...and get a better handle on your contracts. If you'd like more info, you can sign up for a quick demo here.